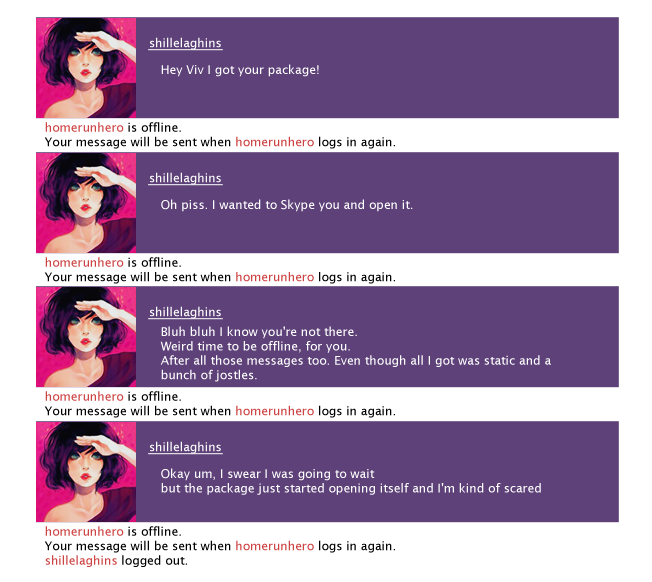 shillelaghins: Hey Viv I got your package! Your message will be sent when homerunhero logs in again. Two glowing green eyes peered out from the package. Ronit stood up fast, but her legs got tangled up in the power cable. She pulled it from the wall in her struggles to stand. The laptop fell to the carpet and snapped itself shut. In a few seconds, a grey humanoid thing was standing on her bed. It looked down at her and, in a mechanical voice with a metallic echo, it asked her for her rank. She threw a shoe at it. Scrambling to her feet, she hurried to the door. She had it half open when she realised that the robot–this was Vivane, of course it was a robot–was still standing on her bed. It gazed down at the shoe, which had struck its chest before dropping to the floor. It looked bewildered. Almost unhappy.